Under federal law, employers of tipped workers are only required to pay their tipped staff a base wage of $2.13 per hour—an amount that has not been raised since 1991—provided that the sum of an employee’s weekly tips plus their base wage equates to an hourly rate of at least the minimum wage. 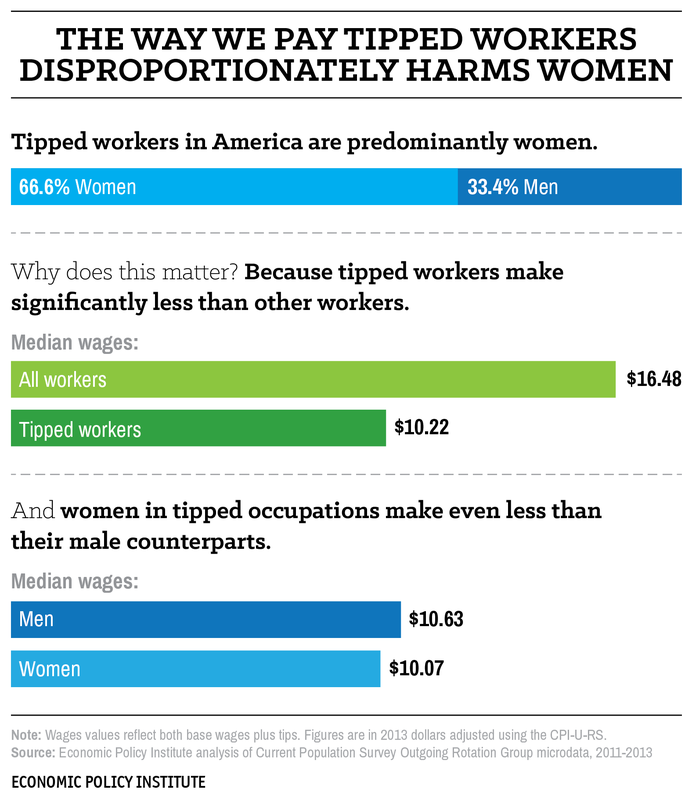 Consequently, tipped work is overwhelmingly low-paying, even after accounting for tips. In 2013, the median hourly wage for tipped workers, including their income from tips, was $10.22 per hour, compared with a median hourly wage of $16.48 for workers overall. This loophole for tipped employers is fraught with problems, and means that customers—not employers—are paying the bulk of workers’ wages at restaurants, nail salons, hair salons, and even casinos. Raising and eventually eliminating this loophole for employers of tipped workers would help to raise wages and stabilize incomes for millions of service workers and therefore millions of women. Seven states have already taken this step: California, Oregon, Washington, Montana, Minnesota, Alaska, and Nevada. In these 7 states, restaurants are thriving and poverty rates of tipped workers are dramatically lower.